We decided to set the Dining Room up as a dual purpose room. My thoughts are baby will sleep in there nights until he sleeps through the night, 11-12 hours. For Isaac that was around 10 weeks old. A 2nd crib was purchased (actually it was a gift! ), bed made, blackout shade installed, and some baby items brought in. The buffet that I wanted to add doors to for ‘safe’ storage is in process; it still needs paint and handles. Doug may finish this weekend, but at least is usable to store some baby things. Isaac has a big boy bed and has been experimenting with sleeping on it. I would say he’s 70% big boy bed, 30% crib depending on how tired he is. I am fine with letting him get comfortable. He stays in and calls me in the morning to come get him. So far so good! Baby clothes (0-6 months) have been washed, sorted, and put away in the boys’ closet and dresser (some in the dining room cabinets too). Our cars are prepped with car seats; grandparents also have a car seat for Isaac. This is big! I won’t feel the pressure of driving both kids all the time and we will not have to move car seats to do it. HOO-RAY! Grandparents are scheduled to help fill in for the first couple of weeks. We are blessed! Don’t know how we would do this without them! 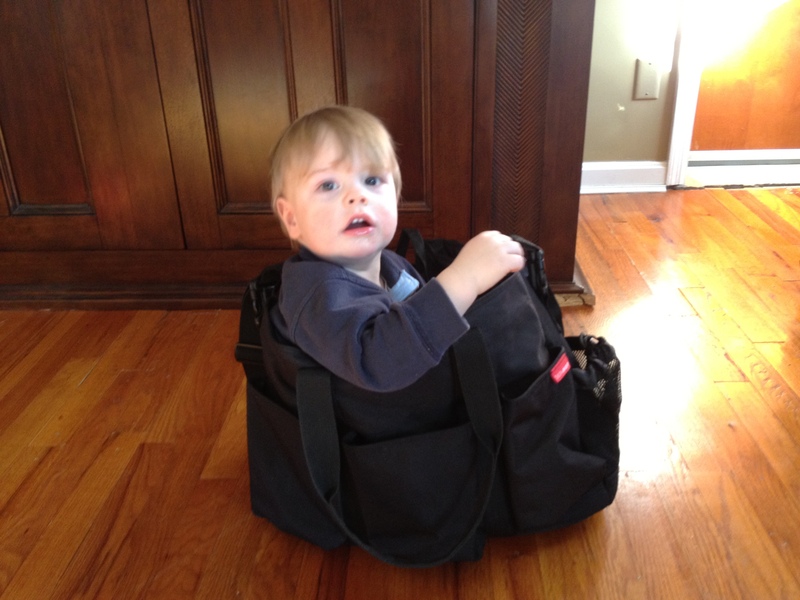 Hospital bag is packed. Baby’s gift to Isaac is wrapped. I even have some Valentine’s Day gifts for Doug and Isaac ready. We even have diapers! Friends, volunteers, and family have been stocking us. Our small group even planned a MealBaby for us. Awesome. I also did a big stock up of our pantry. Hopefully this will help in the first few weeks when I cannot drive. Doug can go grab milk, bread, and fruit, etc. I think we have enough cereal to last through summer, thank you coupons and sales. All the paperwork has been done. And, I even had my LAST dr. appt. That really made it feel final since I have been spending hours there each week. While looking for batteries and a key chain I got frustrated one day off and even got organized our junk drawer. Which turned into all the kitchen drawers, then all the cabinets. Not really on the agenda, but hey?! Our last thing to do is name this baby. We are down to a short list. Doug has a firm favorite and Isaac is calling him that, too. I like the name but like a few others better, so we are waiting until the moment to make it final. Overall I am feeling pretty good about the tangible prep. I wish I could prep Isaac like I can the house and baby stuff. I am hoping he isn’t too jolted. I also hope my healing is quick and easy so I can be a functioning mom of two! I cannot wait to hold a sleeping baby again. This entry was posted in baby stuff, kid stuff, mom, organization and tagged 38 weeks, baby, baby list, baby log, mom, organize, preparation, second on March 15, 2014 by projectmomma. It happened. Isaac’s first injury. It didn’t happen how I would have though…. My boy is active. He is aggressive, fast, and strong. He falls hard but rarely cries. He’s been climbing on everything and standing up. We have to watch him in the dining room as he can get up on the chairs and up on top of the table. He’s still negotiating how to get down off of things, but that doesn’t seem to stop him. He also loves steps and I’m nervous that we will leave the basement door open because he wouldn’t be scared to try to go down. But he was not hurt trying these. Instead… a game of peekaboo, a NASTY game of peekaboo. Isaac loves to get up on our bed so he can look in the mirror at himself. He will play peekaboo with himself hiding behind the footboard. I am always close behind him; I’m afraid he’ll lose his balance and tumble over the end of the bed. This day he was playing his game, squealing and hiding and “boo”-ing. Then…. BAM! I was right behind him so I saw his head hit the footboard. The loud crash, then the crying. He turned to me and I saw blood. I grabbed him and took him the the kitchen. He as crying hard as he rarely does, so I knew he was really hurt. I wiped the blood from his mouth, but more kept coming. I took him into his room and laid him on the changing table to try to get a view in his mouth. I told myself “be calm for him” even though I was freaking out on the inside. That is when I saw a hole – where his front, right tooth used to be, there now was nothing. His gum was fat and my first thought was that his tooth was shoved up into his gum. “Oh my gosh, where is his tooth?! !” I was thinking as I calmly said, “it’s OK honey.” He was still crying and bleeding and it was hard to get a good long look. I brought him back to the kitchen and got a cold wet washcloth to hold on his gum. I sat in front of the TV to distract him so I could call the doctor. 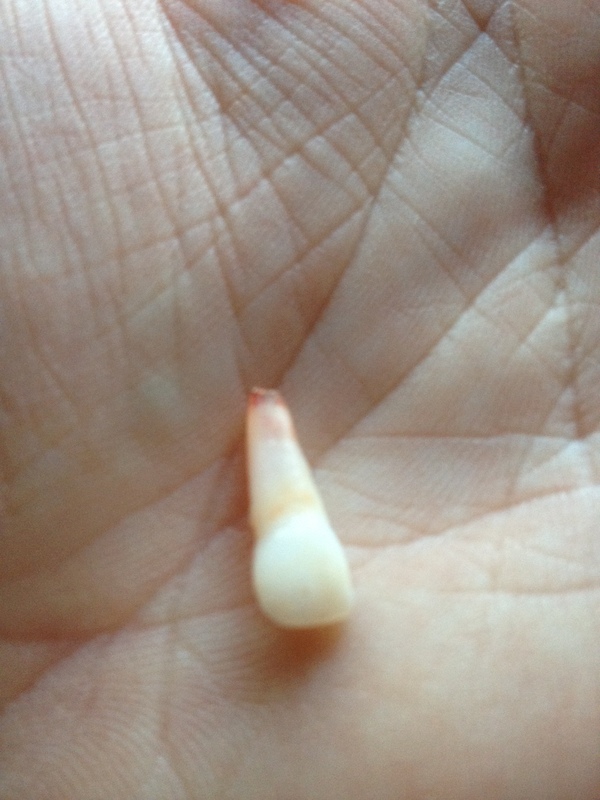 It was while I was on the phone with the pediatrician that I thought to look for a tooth or part of a tooth. Oh, and I found it… root and all! Oh my goodness that had to hurt!! He had to hit our bed so hard!? Poor baby. By this point Isaac was calm, smiling at the TV and drinking water, still bleeding but not as bad. The Dr. wanted to see us and got us in right away. I thought we would be making our first trip to Children’s Hospital for sure. Turns out they will not put the tooth back in as his mouth as it is still growing and it may hinder the next tooth. 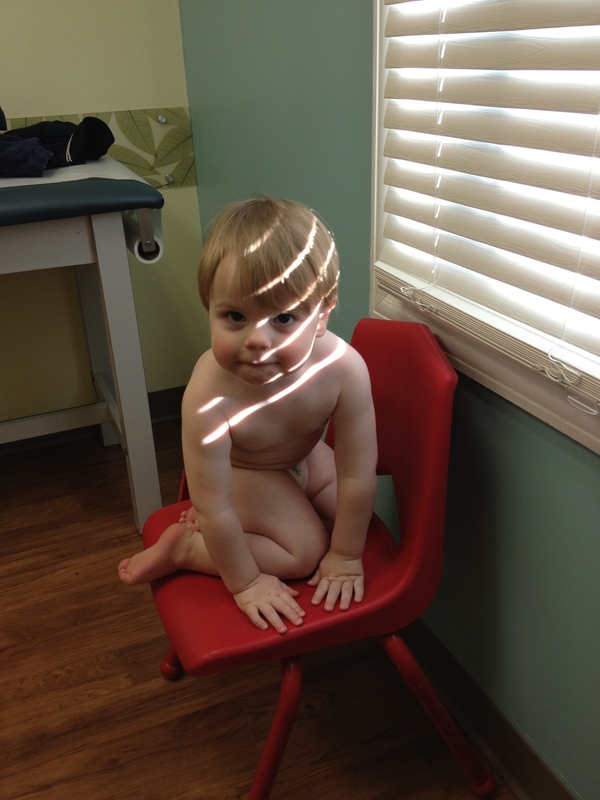 The kid ejoyed himself at the doctor’s office though. I still want to get him into the Pediatric Dentist ASAP to get their opinion, but it is likely he will have a little gap until that adult tooth comes in. I feel so bad for my boy! Will he have a gap until he is 5 or 6? That is so sad right? I know that there are a lot worse injuries and that we are blessed to have a healthy boy, still, I couldn’t help but feel sick last night. Even after he went to bed I couldn’t shake it. The sound of him hitting that bed and the first site of his gap. This kid has ruined me. I saw this quote today, and I think that it is so true. ‎”Making the decision to have a child – it is a momentous. It is to decide forever to have your heart go walking around outside your body.” – Elizabeth Stone. My heart was breaking over this. This mom stuff is hard sometimes. 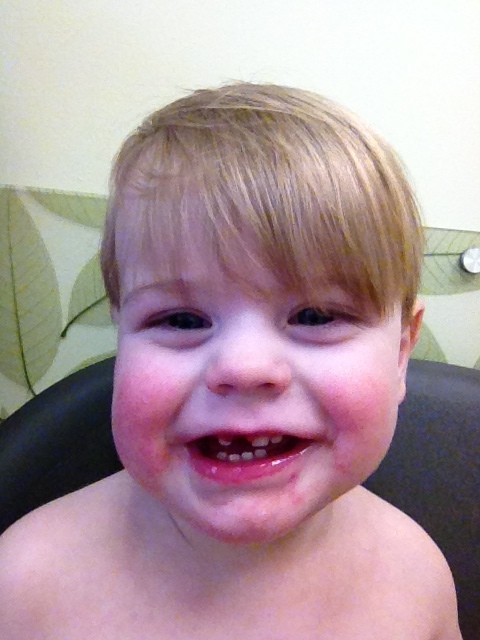 This entry was posted in isaac memories, mom and tagged baby injury, lost tooth, mom on January 19, 2013 by projectmomma. Bag It Like I Stole It! I adore Buy Buy Baby. The store came to Cincinnati the year before Isaac was born and I am SO GLAD! I registered there and had a great experience with them. They received returns off my register easily before Isaac was born and the whole year after (completely opposite of the other place I registered). Last week I returned a few gifted toys that I am not even sure were purchased there. They rock. The people are nice and helpful. 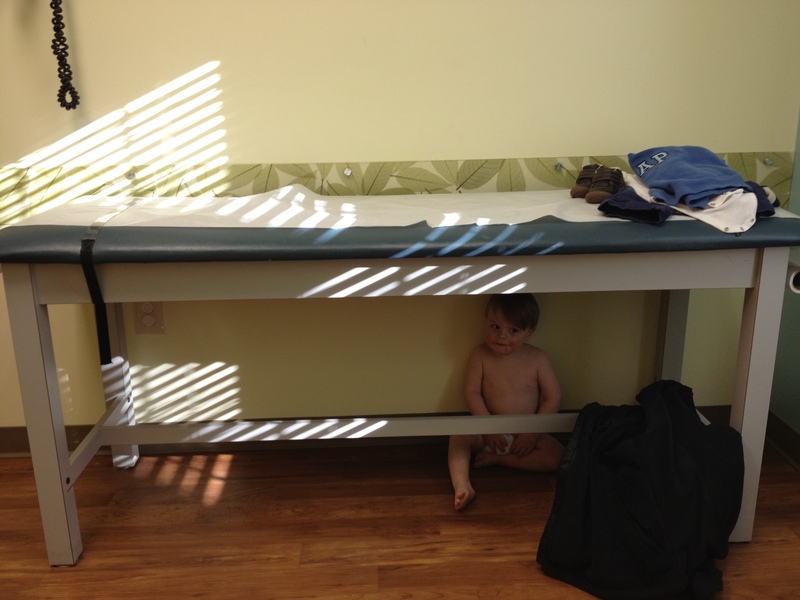 Our store has a nursing room too, so it made it easy for me to make a trip when Isaac was itty bitty. They also sell great products. 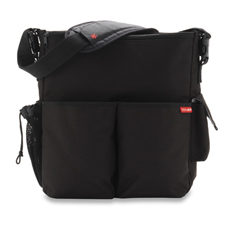 The carry some higher end brands that you cannot find at other baby stores, some that the quality is worth the investment. Stroller section alone is bigger than my house (at least it feels that way). To wrap it all up their coupons are incredible. They frequently mail $5 of a $15 purchase and 20% off an item and you can use as many as you want. They will also take coupons from competitors. Since the location is about 35 minutes from our house, I will usually save my coupons and make a list then optimize them before they expire. I wish I had kept track of all my savings because friends it is a lot. I leave with a smile on my face feeling like beat the system somehow. So last week I had a few returns and a pile of coupons that were set to expire. I decided it was time for a trip but only had a few items that I was looking for: a few self-feeding spoons, straw sippies, maybe some plates, possibly a birthday gift for Isaac’s girlfriend. They received all 3 toys and I had a gift receipt of $53 to spend. I loaded up on the items I new that I needed. 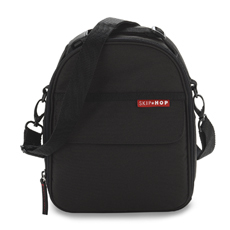 I also was thinking about a new Skip Hop bottle/lunch bag. I was happy with the quality but mine was kinda stinky, so I picked up on of these too. It matches my beloved diaper bag which was in great shape, so I figured with $5 off coupon it was worth it. 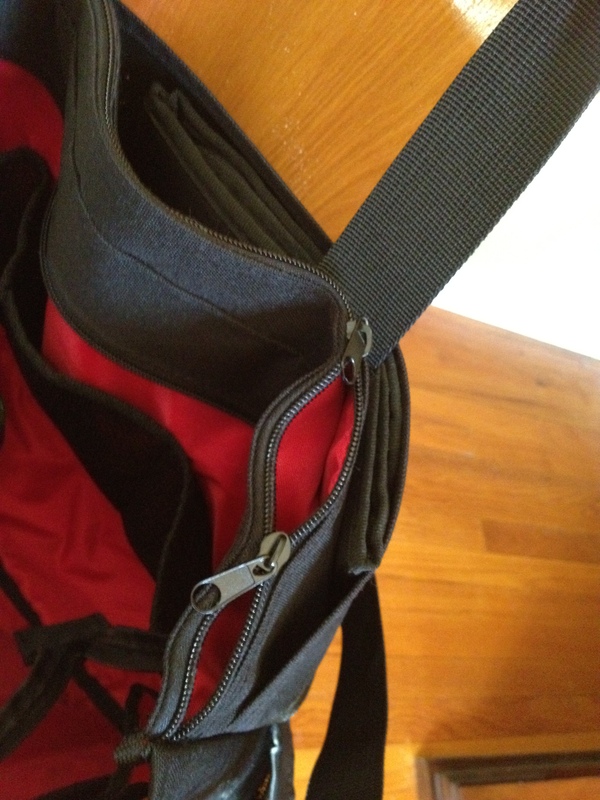 It is hard to read, but says the date of return was 9-17-2012 for a broken zipper. Original price $79.99 and Reduced Retail $30.98. 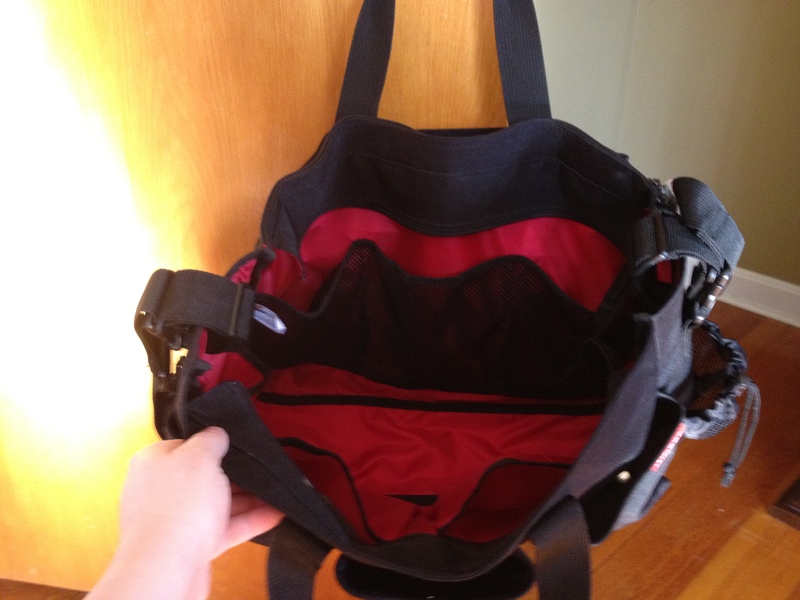 I looked at the bag and saw no other defects, the middle zipper was open so I figured it was the reason for the return. I wasn’t sure I wanted to pay $30.98 even after coupon, so I carried it to the register with me to see what I could get. I figure my seamstress could fix the zipper for $10 or so, so if I could get them down to $20 (then another $5 off) it would be worth it. I asked the sales clerk if she would take $20 for it and she said she would have to call the manager. When the manager came I thought twice and asked her if she would reduce the price. She asked me the date, and since it had been over 3 months she cut the price in half!!! YES!!! $14.50, people! After $5 coupon it was down to $9.50. Oh Em Gee! 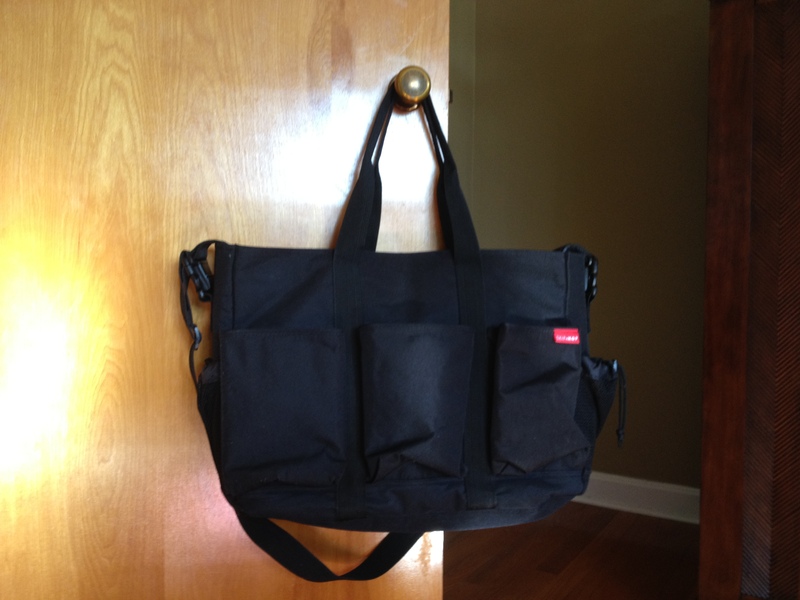 So here is my new bag… Once I got home, I tried out the middle zipper that I thought was broken and it worked! Turned out the broken zipper was on the side where there was a double zipper option, meaning only one of those zippers does not work! What? I don’t even have to get this baby fixed. Happy Momma, right here. Thanks Buy Buy Baby for treating me so good, you have a customer for life! This entry was posted in baby stuff, deals and tagged buy buy baby, deal, diaper bag, mom, skip hop on January 8, 2013 by projectmomma.